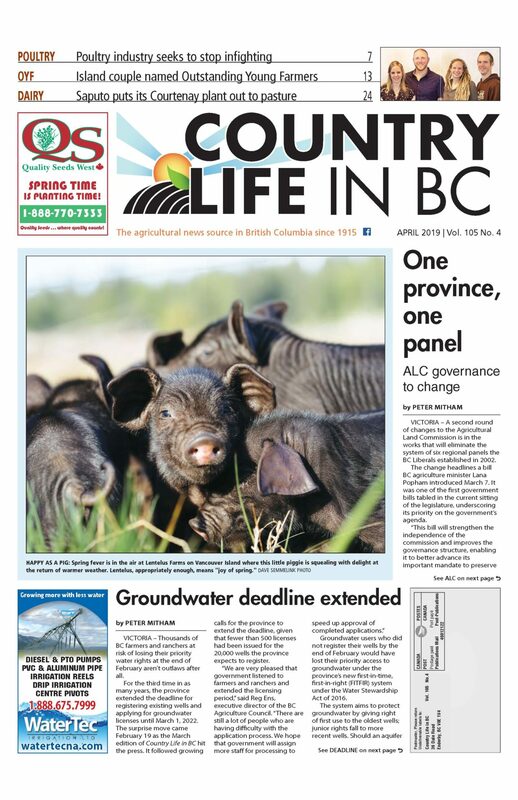 Country Life in BC has been proudly delivering news to BC farmers and ranchers since 1915. Every month, our subscribers turn to Country Life in BC to find out what [and who] is making news in BC agriculture and how those events [and people] may affect their farms, ranches and agri-businesses. They also refer to Country Life in BC as their monthly resource for businesses and services that will help their farms grow! Country Life in BC boasts the highest paid and highest overall circulation of any farm publication in BC and we are the only one that covers every sector of our growing industry. From berries to beef, dairy to dirt, fruit to feathers [and everything in between], if it’s being farmed in BC, it’s on our radar! Our exclusive and award winning news- and event-based stories are tailored to be of specific interest to the commercial farmers of British Columbia. We publish monthly and deliver more value for your advertising dollar than any other BC farm publication. We present industry news in a professional, reader-friendly, familiar format to a loyal subscriber base. BC farmers and ranchers trust Country Life in BC to deliver the news and stories that will help them understand the industry and grow their businesses. You can, too! Contact Cathy Glover for rates and deadlines. Use these links to learn more about the products and services our current issue advertisers have to offer BC farmers and ranchers. Lower Mainland Horticultural Improvement Assoc.